A sharp uptick in housing prices put stock on a path to open signficantly higher Tuesday. Before the open, S&P/Case-Shiller reported that housing prices rose a better-than-expected 10.2% during the first quarter, marking the sharpest jump since 2007. 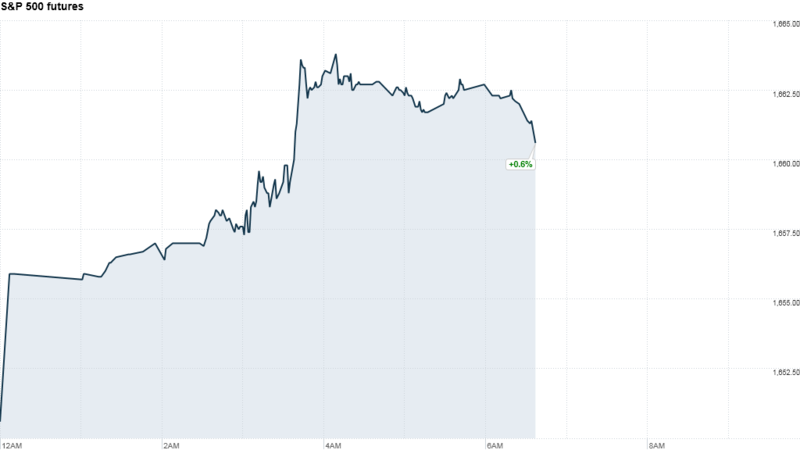 U.S. stock futures were pointing to significant gains, with the Nasdaq indicated to open roughly 1% higher. Dovish comments from central bankers in Japan and Europe also added to the rally in global markets. "Those gains in Europe and Asia are spilling over into the U.S. markets," said Peter Cardillo, chief market economist at Rockwell Global Capital. Bank of Japan board member Ryuzo Miyao said Tuesday that the central bank would continue to put downward pressure on rates, even if expectations for a Japanese economic recovery were putting upward pressure on rates. Separately, European Central Bank Executive Board member Peter Praet said the ECB could still cut interest rates further if needed. "After last week's turbulence, these pledges of easy money will help alleviate some of the fears the Fed will have an early exit in the United States," said Cardillo. Asian markets closed firmer Tuesday, with the Nikkei and Shanghai Composite index both rising by 1.2%, while the Hang Seng jumped by 1.1%. European markets also made solid gains in morning trading, with all major indexes up by more than 1%. There will be some domestic news for investors to chew on as they come off the holiday weekend. The Conference Board's consumer confidence index will come out at 10 a.m. ET. In corporate news, Tiffany & Co (TIF) reported better-than-expected earnings but lowered its revenue outlook. Valeant Pharmaceuticals said Monday it was buying eye care specialist Bausch & Lomb from private equity firm Warburg Pincus. U.S. shares of Valeant (VRX), Canada's largest drugmaker, rose 8% in premarket trading. Last week, U.S. stocks snapped a four-week winning streak, as the prospect of life without Federal Reserve aid sank in. Investors were rattled by signs of a growing split within the Fed over the size of the central bank's bond buying program, which has been a driver of the bull market over the last few years. With the major U.S. gauges up about 15% for the year, some analysts believe the market is on the brink of a pullback. Others argue that stocks will continue higher as investors who missed the rally look for opportunities to buy. Investors had a rude awakening last Thursday when the Nikkei index plunged by over 7% in its worst day for two years. The Japanese index has been volatile since then, and dropped a further 3% on Monday before Tuesday's rebound on Miyao's comments.